In a a few minutes on foot there are many restaurants, cafes, wine shops and all the night life. 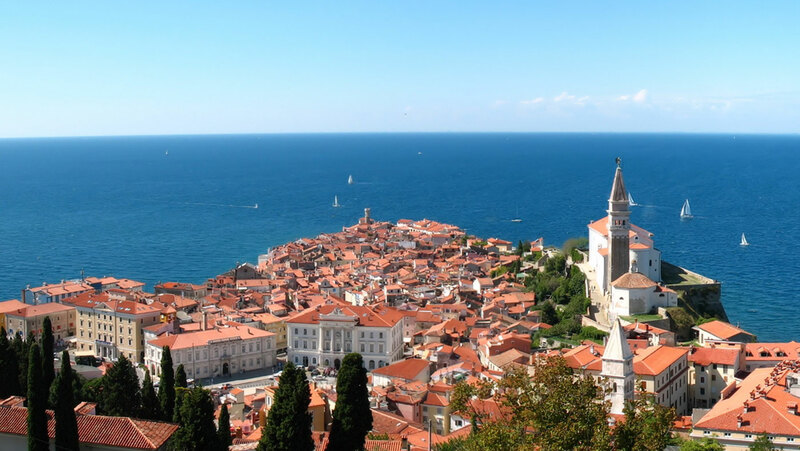 Tartini Square is the centre of Piran and the largest square. It got the name by the Giuseppe Tartini (1692 – 1770), the famous composer and violinist. The main square became in the end of the 13th century. The image, which has it today, got in the other half of the 19th century. It began with the covering of the inner port. On the square are Tartini house, the Saint Peter's Church, baroque house, hotel Tartini, interesting stony columns with flag pole, the doors of Saint George, the judge palace, town hall, Tartini memorial, Loggia, Gothic house, called Venetian and other. In the atrium of the town hall we see the polygonal ston with quantity measures and inscriptional slabs with some arms from the old town hall. In the majority in more important buildings were built in the Venetian lions with the open book. The open book meant peace and close book meant war. The loggia was situated in the area of the present Coastal galleries. In the loggia were meeting the town's magnates. Venetian house is a wonderful red building, which was made in the middle of the 15th century. 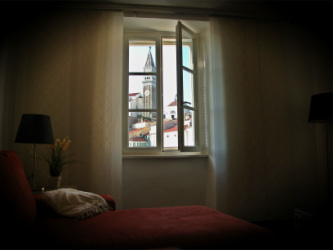 It is the example of the Venetian and Gothic architecture in Piran and the oldest building in the square. The most interesting is the corner Gothic balcony. The bronze Tartini monument was erected in the year 1896. It was made by the Venetian sculptor Antonio dal Zotta. It is connected with the Church of Saint George. The Tartini house is ranged among the oldest houses in the square. It was built in the Gothic style. Later they renovated its exterior in new classical style. The last renovation was in the years from 1985 to 1991. Today is the seat of the Italian Community. In the first floor is the Tartini memorial house. The house is intended for exhibitions, performances and art workshops. The stony pillars for flags are in the entrance to the Tartini square. They are from XV. century. The court house was built in the area, where was in the 14th century Fontik, the storehouse for flour and cereals. The pawnshop town got in the 16th century.